The Art of Map Illustration combines practical instruction with inspirational art and photographs to both enliven and educate aspiring map artists. 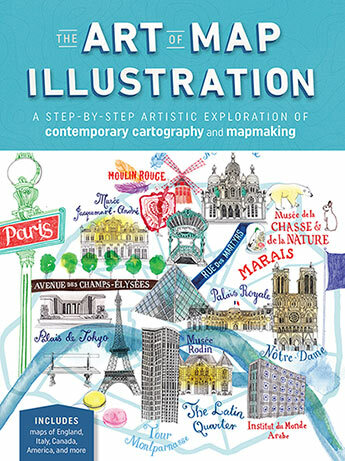 In The Art of Map Illustration, five well-known artists take you on a journey through their unique techniques to map making with a range of media, including pen and ink, watercolour, and mixed media, plus tips and advice for working digitally. Each artist provides a brief overview of their recommended tools and materials, along with tips and inspiration for using, exploring, and experimenting with the medium. From intricate line drawings, to bold and colourful city maps, you will bring your favourite locations to life, and use visual storytelling to express time and place. Packed with engaging instruction, professional tips, and beautiful finished artwork, The Art of Map Illustration is the perfect resource for contemporary artists seeking to learn the time-treasured art form of cartography. James Gulliver Hancock feels sick when he’s not drawing. He panics that he may not be able to draw everything in the world… at least once. His obsession with re-imaging his world has seen him work for major print, TV and music publishing releases. He has participated in projects in the USA the UK, Indonesia, Austria, Germany, France and Australia, taking his whimsical perception around the world. Currently he works out of two studios: one in The Pencil Factory in Brooklyn, New York, and from his homeland studio by the beach in Sydney, Australia. London-based illustrator Hennie Haworth studied at Brighton University before embarking on her artistic career. She has worked with a wide range of clients, including Converse, Louis Vuitton, Dwell Magazine, GQ Magazine, Royal Mail, Logitech, Hyundai, and Morrisons. Hennie is a regular illustrator for National Geographic's 'City Life' articles. Stuart Hill is a freelance illustrator and designer from the flat lands of Lincolnshire, which might explain his fear and fascination of mountains. He likes printed textures, handmade type, and riding his bike. He specialises in editorial illustrations, typography, and making maps. Sarah King is an illustrator from London, England. Her love of travel led to a natural love of maps, and illustrating maps has become a way for her to tell stories of the places she has been.